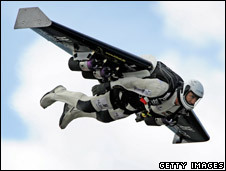 >Swiss does something interesting – jetpacks from France to England! > <– Pretty amazing stuff. I so wish I would be alive in 200 years, just taking the 'jet' for a fly to the corner shop. The 49-year-old flew on a plane to more than 8,200ft (2,500m), ignited jets on a wing on his back, and jumped out. He said weather conditions on Friday had been perfect and his success signalled “big potential” for people to fly “a little bit like a bird” in the future. Known as “Fusionman,” he was aiming to follow the route taken by French airman Louis Blériot 99 years ago when he became the first person to fly across the English Channel in a plane. In Dover, Mr Rossy flew past South Foreland lighthouse – which the building’s manager Simon Ovenden said Blériot used as a target during his pioneering flight – and looped onlookers before landing in a field. “It’s a remarkable achievement, we saw the climax of his attempt as he came down to earth with his parachute. It’s been an exciting afternoon,” said Geoff Clark, a 54-year-old spectator from Chatham, in Kent. Mark Dale, the senior technical officer for the British Hang Gliding and Paragliding Association, described Rossy’s flight as a “fabulous stunt”. The flight was broadcast live for the National Geographic Channel. Its producer, Kathryn Liptrott, told the BBC Mr Rossy was fearless. “When we’ve talked to him and asked him are you worried about risk his quote consistently is: I’m not worried about risk, I manage risk. The longest flight he had previously taken lasted 10 minutes. The wing had no rudder or tail fin, so Mr Rossy had to steer it using his head and back.